First, braise the pork in autumn sauce and wine until done. Next, smoke the braised pork briefly with its cooking juices over smouldering wood shavings. The pork will be slightly dry on the outside, moist inside, and extremely fragrant and tender. The household of Wu Xiaogu “Guangwen”  excelled in preparing this dish. : Considering how strong the smoke taste will be, the braising can be done either in the manner of Red-braised pork or the second method of White-braised Pork. : I could not find any information about what is a Guangwen (廣文), but it sounds rather Official-like. So there. thankfully Mr/Mrs/Dr Chan was kind enough to point out that it’s likely a pen name. 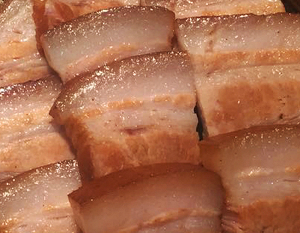 : Pig stomach has a fantastic crispness (脆彈, lit. crisp and bouncy) when cooked a-point and a soft springy texture (“Q”) when braised. The only problem is that it’s an absolute pain to clean. There is a lot of slicing, scrubbing, massaging, scraping, rinsing, and parboiling to rid the stomach of its sliminess and smell. Just Google “洗猪肚” (washing pig stomach) and you’ll see numerous articles devoted to the subject and numerous strategies to speed up the process. My mother cleaned tripe using Coca-Cola, which appears to also work for pig stomachs. ：The inner membrane is the mucosa and the outer membrane is the serosa, both of which need to be removed before stir-frying due o their tough and unpleasant textures. 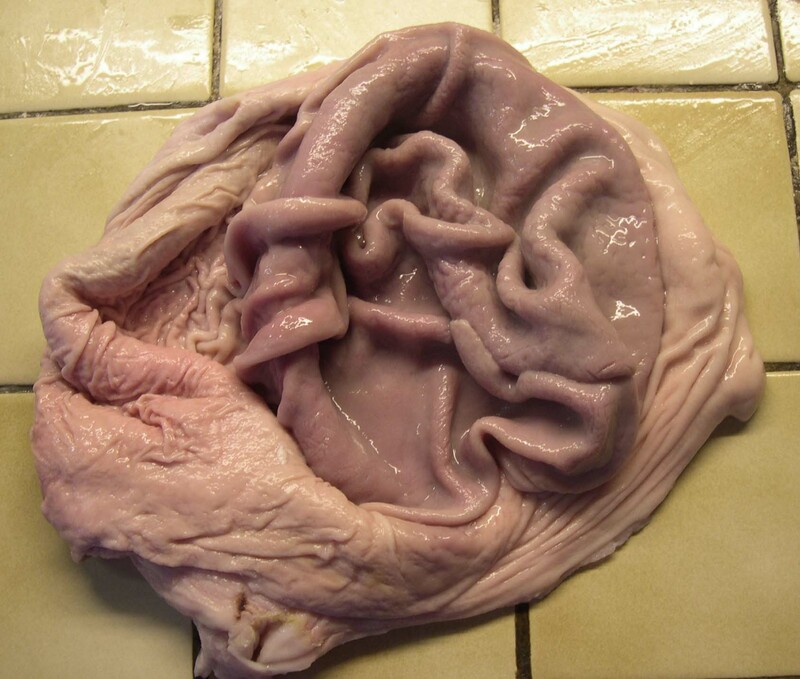 Only the orthogonal layers of smooth muscle tissues and connective tissue are used in the dish, providing the a nice “crisp” bite. : An example of stomach cook in this fashion is the famous Shandong dish: Youbao shuangcui (油爆雙脆, lit. two crisp items stir-fried in boling oil), which consists of rapidly stir-fried “chrysanthemum” cut chicken gizzards and pig stomach. : Correct me if I’m wrong, but doesn’t this together make three methods and not two?